Mark Sarigianis contacted me last year with the hope that Anchor might be able to help David Johnston and his Sharp Teeth Press with the publication of Evan Rail’s extraordinary essay on Why Beer Matters. I was already familiar with Rail’s Good Beer Guide to Czech beers, which came in handy on a recent trip to the Czech Republic with the San Francisco Symphony. Rail’s a wonderful writer, whose ideas about beer are both cogent and illuminating. Why Beer Matters answers the question eloquently and provocatively. Having been involved with Anchor projects from Ninkasi, the re-creation of an ancient Sumerian beer, to Anchor California Lager®, the rebirth of California’s first genuine lager, I particularly enjoyed his reflections on beer and the passage of time. How fitting it was, then, that SharpTeeth Press was going to use centuries-old papermaking and printmaking techniques to craft Rail’s essay into a handmade book about beer, each signature painstakingly typeset yet effortlessly elegant in its resultant beauty. And how happy we at Anchor were to be able to play at least a small role in helping David Johnston and Mark Sarigianis realize their dream. My name is David Johnston, proprietor of Sharp Teeth Press in San Francisco. Sharp Teeth Press is a young publishing and job printing company dedicated to letterpress printing, typecasting, and bookbinding of the highest quality. 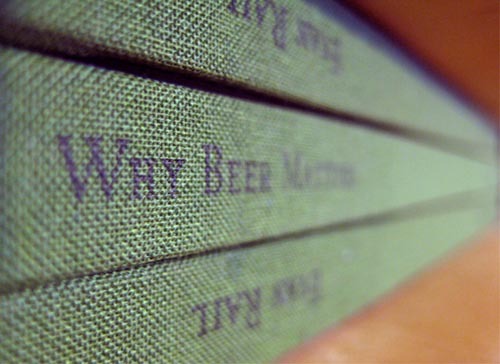 Our first publication in 2013 is Why Beer Matters, by beer writer Evan Rail. Evan is the foremost English-speaking expert on Czech beer culture and wrote the CAMRA Good Beer Guide to Prague. He self-published his essay and released it only as an eBook last year. 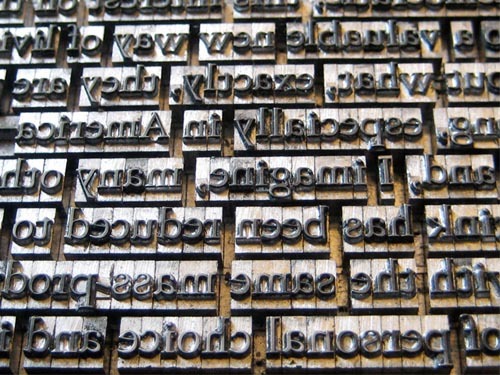 Sharp Teeth Press has produced the first print edition in a deluxe letterpress format. 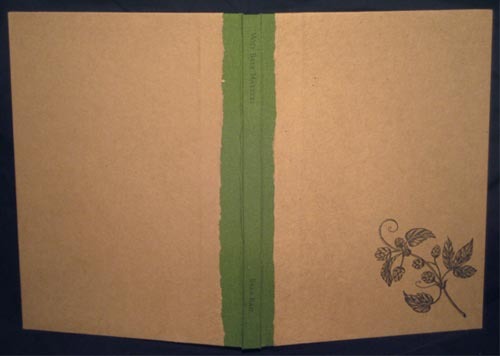 Why Beer Matters was hand sewn and bound by the press with very special paper, handmade from burlap hop sacks. 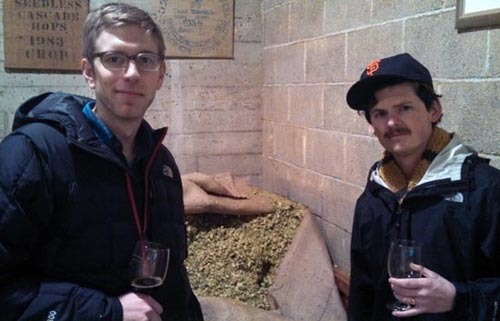 Eight months ago we contacted Dave Burkhart at Anchor Brewing Company with an odd request. We needed the burlap sacks that hop cones are stored and transferred in. This was a more difficult request for a brewery than one may think. First, the vast majority of breweries in the United State use hop pellets to make their beer. These are stored in plastic containers and have a longer shelf life than whole-cone hops and thus have become an industry standard. That is, unless you are awesome, old school, and cling to the great notion that “the less processed, the better.” Such is the case for a brewery like Anchor, which uses only whole-cone hops. Here at Sharp Teeth Press, fine beer is almost as important to us as fine printing, and thus we were aware that Anchor was one of the only places to go for such a project. With the help of Pam DeLuco of Shotwell Papermill, we set out to turn burlap into paper. This entailed cutting the sacks into one-inch squares (a longer process than one might think) and then boiling the mixture with soda ash for three hours. This was done in several batches in order to get enough material to give to Pam, who then hand-made the mixture into paper at her studio. The result was a strong jute paper, which we could use to cover boards for the book, thereby literally “binding” the process of beer production and book production together. Each piece was then letterpress printed with an illustration of a hop vine by a friend of the press, Christine Dryer-Sarigianis. The STP edition of his essay was set entirely by hand with metal type and printed on fine, archival French paper. Hand-set type is a rarity these days, and carries with it its own set of troubles and pleasures. A trained eye for proofreading is necessary. Because of spell-checking technology, which has been ubiquitous for decades, our eyes are no longer accustomed to the kind of close reading necessary to spot all potential errors. And, as can be imagined, hand setting is quite slow. As an example, let’s say the average typist can type 35 words per minute. Why Beer Matters, in contrast, was set at a rate of about two words per minute, or three hours per page. Regardless of its tribulations, however, the opportunity to immerse oneself in a text as deeply as is necessary to hand set that text is rare and enriching, allowing the typesetter to internalize the text by reading it more closely and slowly than anyone—other than the author—likely ever will. Some people argue that the first human civilizations were built up on a foundation of bread and beer-like fermented grains. At Sharp Teeth Press, we’d like to believe this is true, and we also believe that many of civilization’s greatest achievements during the past several hundred years have been made possible by the passage of information through printed media, primarily books. It is with great pleasure that we join together these two pillars of humanity, one scholarly and one gastronomical. Evan Rail points out that “Fine wine, cheese and chocolate provide material for meditative sensory evaluations, of course, but the new interest in good beer has extended the opportunities for this type of calm introspection to millions of people beyond the traditionally rarefied realms of connoisseurs and gourmets.” We invite you to share his worldly and charming opinions on beer and its importance through our first offering, a labor of love and tradition, not unlike the brewing of beer itself. Why Beer Matters is for sale at SharpTeethPress.com and can be purchased for $100 plus shipping and sales tax when applicable. 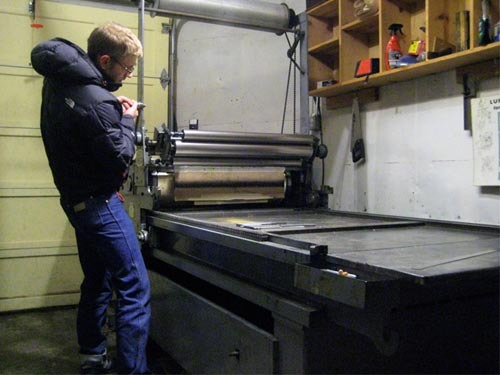 The proceeds of the sale of this book will help get Sharp Teeth Press a larger studio and more heavy machinery in order to produce beautiful handmade books in a generation that is growing more and more digital.